"Were you at Bluebeard's Castle on Friday night?...." "Did you hear the Bartok on Friday?..." "When she goes to open the fifth door..."
"Every hair on my body stood on end..."
"Did you know John really was injured that night, the walking stick was not a prop?..." "It was good they didn't play some trite encore to spoil the atmosphere..."
"How come the hall was only one third full?" "Where is the Nottingham audience?" "Anyone there will remember this for the rest of their lives"
"One of those peak musical experinces you'll carry to your grave"
So what road to damascus epiphany caused two middle aged men to babble like religious zealots speaking in tongues? A concert. 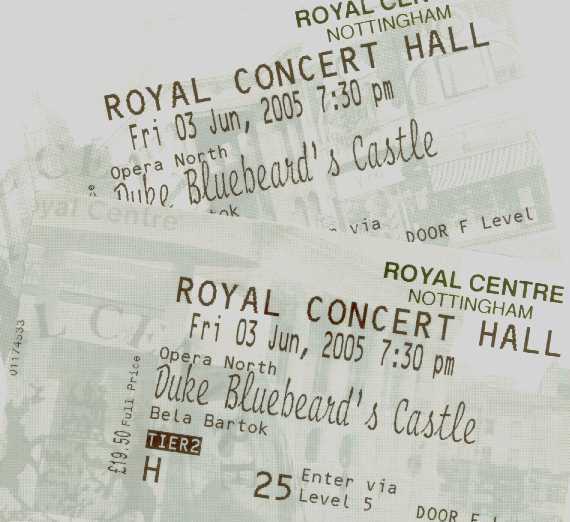 A performance of Bartok's Duke Bluebeard's Castle by the Northern Opera Company at the Royal centre Concert hall in Nottingham on June 3rd 2005. The opera was staged in the concert hall rather than the theatre next-door because the necessary size of orchestra could never be shoehorned into the tiny orchestra pit and the whole work is sung by just two voices. The hall was barely one third full, and the empty seats represent all those Nottingham residents whose shallow lives will remain forever shallow by their abscence from experiences like this. I do not blame them for their abscence, who could have predicted that the £19.50 ticket price would yield such an amazing event? I didn't notice any particular effort at publicity beyond the usual Northern Opera leaflet, and £19.50 might seem expensive for an unpredictable night out compared to a meal & a film at the neighbouring Warner Village complex. Increasingly people want predictable lives but that predictability will rob them of opportunity for these peak emotive-artistic high-points that do not fit the linear narratives of our everyday lives. But what relevance has this to a hifi & audio webzine?" This is precisely the reason good domestic audio is so important. This is equally precisely the reason the distractions of multi-format & home-theatre have no place in a music orientated audio website; those diversions are just the noisefloor from which our persuit of more musical audio systems emerge. The myriad seductions of the transglobal domestic electronics industry are all fun in their place; enjoy gamecubes & playstations & widescreens & ipods & cellphones (with more processing power than a 5 year-old desktop pc), but make time for the emotional roller-coaster of great music. This is also the reason why we are continually driven to recreate these better musical experiences in the home. An exploration of the psychological aesthetics of musical experience may indicate why our stereo systems assume such importance in our lives. Bartok’s only opera consists of the two voices of Judith (Sally Burgess) and Bluebeard (John Tomlinson), the absent voices of the 3 previous wives, and the ever present voice of the castle itself (the orchestra). The audience seemed universally bound by the spell of the music & the psychological intensity of the performance affecting the psychological state of most audience members and the collective psychology of performers and listeners further reinforcing the individual experience initiated by aural perception of the music itself. The conscious experience of the musical content is just part of the effect. The subtle nuances of the performance are unconsciously experienced by the listenners, so they are moved by the music even though they do not know why or how. The mechanisms by which this happens are as yet poorly understood. From Freud's clumsy analysis of Da Vinci, through the post-modernists, to the latest crop of FMRI wielding neuro-psycho-analysts numerous part explanations have been proposed, recently concentrating on the autonomic nervous system. Despite 100 years of psychological enquiry, and centuries of philosophical enquiry, we still have very little understanding of what is really happenning here. How can a sound-performance by a group of trained sound-makers (musicians) create a physical response in this listenner and many sitting around him? One of the more likely explanations was proposed by Anton Ehrenzweig in his book The Hidden Order of Art in 1967. He suggested (almost inverting ideas dating back to Freud & Jung) that the unconscious plays as much part in perception as it does in Freud's model of phantasy & repression. Freud's model of the unconscious as a repository of stuff that doesn't or mustn't fit in the conscious mind is replaced by one where the unconscious is the key to human endeavours like art & music, building on Jung's model. Ehrenzweig described the "The absent minded texture" of music & drawings involving incohate & abstact forms as being a key ingredient of paintings & music, as essential as the articulate forms that we can recognise consciously. Ehrenzweig adapts the Nietschean distinction between 'Appollonian' mode (of the rational) and 'Dionysian' mode (of excess and intoxication). In art & music Dionysian form equates with inarticulate form - it is neither beautiful nor ugly. Artists and musicians become so practised and accomplished in their craft that they no longer have to peform fully in the rational conscious parts of the mind/brain, but that they can allow themselves to become immersed in the emotion of the piece and of their performance of it, endowing the performance to become imbued with very subtle (unconscious) clues that will be experienced (unconsciously) by the listenner, who will be deeply moved even though unaware of the neuropsychological mechanism involved. David Maclagan's book Psychological Aesthetics (2001) concentrates on similar processes in paintings, but the ideas are applicable to music and the writing style clear and accessible. David describes the facture of the original work of art as bearing the imprint of the artist's emotional state at the time of creation. The artist's skill and experience with their medium enables a familiarity with the process that allows them to enter the "manic-oceanic" phase of creativity, it is after such a moment that an artist may step back with surprise and delight at the latest marks on their canvass. They experience ecstatic comprehension - comprehensively integrative - an almost magic "at one-ness" with their work. "intense concentration on the background of consciousness"
A printed photographic reproduction of a painting lacks the dynamic emotional impact of the original. The viewers' unconscious minute shifts of the head and eyes will make them aware, through this subtle texture, of the method of application, the speed of application, the subtle blends on the fringes of each brushstroke, that the staionary monocular viewpoint of the camera cannot reproduce, however good the lighting and resolution of the film or filemaker. The recorded performance faces similar problems with tone & dynamic range but with the additional burden of the temporal dimension. Reproduction of time (classic flat-earth priorities of pace, rhythm & timing, commonly abbreviated to PRaT) is as demanding as accurate replication as the dynamics and tone. Just as the coffee-table book never reproduces the majesty of a Tintorretto in a Venetian church, the replayed performance will never be able to reproduce perfectly the live experience, so why bother at all? There are recordings of such emotional intensity and clarity that they often rekindle an emotional response even when quite poorly replayed. The Jacqueline du Pré Elgar Cello Concerto is one that can achieve this for many people even on a car FM radio. 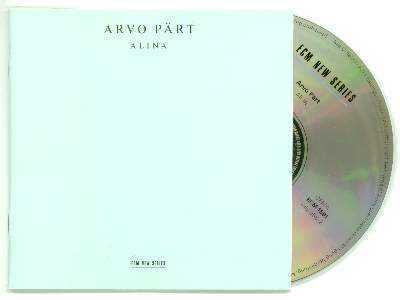 Arvo Pärt's Spiegel im Spiegel has a similar effect on me some of the time. It demands impeccible rhythm & timing to work. It has become one of my killer tests of cd players for this reason. If the player is working I forget the music & the player and I become moved by the experience of hearing it. Anything less leaves me bored as though by a piece I dislike. 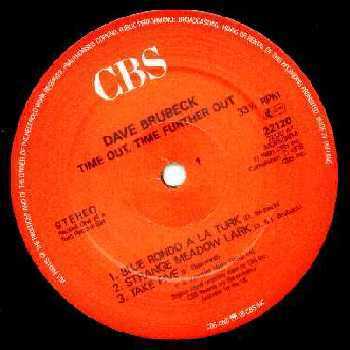 Dave Brubecks LPs Time out and sequel Time Further Out demand similar high levels of performance from the system to engage this listenner. I get different, but consistent experiences from vinyl lp and cd through my own system, and different again through other systems that may simply be due to my psychological state at the time, but may equally be due to my phenomenological encounter with the engagement of the musical performance as reproduced through that particular system. I have recently been trying the Vacuum State Electronics modifications to the Sony SCD-555ES SACD player and the musical encounter with the SACD recording of Time Out, loaned to me by Colin Yallop of Chevin Audio, is different again. 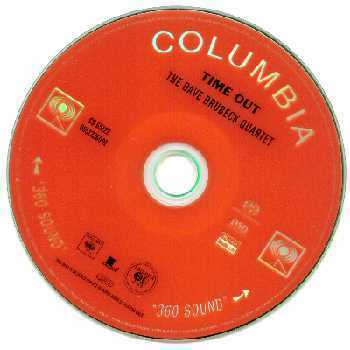 I only heard Brubeck perform live once at a Jazz Festival with my father as a schoolboy 30 years ago so my mind carries little backup information of the live experience, but my son does play Take Five on his alto so I also have a live-sound reference and Take Five's 5/4 time signature demands attention when correctly timed. My father heard Brubeck perform this material several times and he was happy with the reproduction of it on his old Ferguson Stereogram with Garrard autochanger and crystal pickup, perhaps the reproduction acting as a prompt to his stored live experiences. Most professional or trained classical musicians I have met have also been content with mid-fi at home. One explained to me that she only needed the cd player to remind herself of the structure of a piece and her memory would add in her favourite perfomances, including those in which she had participated. The less blessed among us need reminders of the great performances to achieve similar encounters with recorded music. Part of the problem comes from the way many recordings are assembled from 'technically correct' segments. The rock musicians whose recording suite is a part of their instrumental vernacular will know from experience how certain techniques will sound and feel, so their use of multitracking from the late 1960s onwards does become a component of the musical experience mediated via similar mechanisms as a well recorded live performance of acoustic musicians. Both recordings deserve equal attention to quality of replay, but for different reasons. The analytical psychologist James Hillman has argued that the quality of our thinking is affected by the quality of our surroundings. Perhaps that's why drivers of cheap plasticky anonymous cars drive them with so little thought (it was a Proton that knocked me off my Harley when it's driver ran a red light while Proton-low-quality-thinking) while owners of classic cars surrounded by Walnut & Leather often drive with more thought, fearing breakdown from any stress to their machine. Studies have also shown increased intellectual performance in students exposed to Mozart during testing compared with those exposed to the usual ambient noise of the clasroom. There was an attempt in Giles Havergal’s staging of Bartok's short opera to use a projection screen above the orchestra to display coloured abstractions designed to emphasise the nature of the journey into the rooms behind the castle's seven locked doors and the protagonists' internal turmoil encountering them. No matter how skillfully executed I stopped noticing these visuals early in the performance. Indeed I was most conscious of the presence of the screen during the first half perfomance of Ravel's Daphnis & Chloe, when the screen obstructed any clear sight or sound line of the performance of the chorus. Onstage Sally Burgess & John Tomlinson as Judith & Bluebeard moved through white painted aisles and a platform threading among the orchestra and wind-band, unimpeded by distracting visual complexity, their simple actions more revealing than any sophisticated special effects. The three previous wives do not sing and were spare in their actions, directing attention to the main protagonists' emotional states with melancholy minimalism suitable to their strange existence in the twighlight between life & death. More visual action would have reduced the impact of the music. "7 What we cannot speak about we must pass over in silence"
Proposition 7 of Tractatus Logico-Philosophicus stands alone. It is the only proposition in that book which passes without further comment, indeed it is the final proposition. It is nonsense. For what we cannot speak about we must make a different noise. That words are insufficient to describe such a profound experience through music despite me becoming a candidate for pseud's corner illustates why performing and listening to music is so important to us. Until there exists any evidence to the contrary I would therefore argue that good audio at home may contribute to our mental health. Ignore the noise and distractions of multi-channel and home cinema and concentrate on building an audio system capable of replaying as much of the subtle nuances and dynamic range of recorded performances and recordings that are performances in themselves. "Art, it is said, releases the unconscious tensions and "purges" the soul"
There are relatively few recordings of Bluebeard's Castle and to reccommend any would be to undermine the point of this essay. So go listen. Having said that, the Opera North performance of Bartock's only opera (and a recording of Nabucco from the same season) are due to be recorded for cd release according to their website. As if to confirm this, the organist Simon Lindley (according to his website) was booked to record the Bartock with them on 5th & 6th June at Leeds Town Hall.